Allison Winters is back in the saddle. Throwing everything at the wall and keeping what sticks is probably not the best idea in any situation. Using your tools wisely is going to make for a much more defined solution, and less damage to your walls. 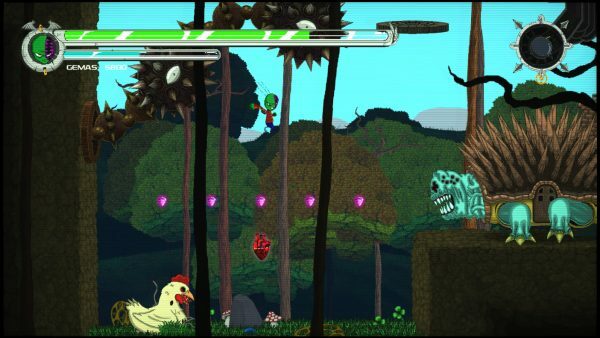 Nightmare Boy is, despite its best efforts, not great Metroidvania game. The foundation of the game appears solid with its running, jumping, and whacking dudes in the face. But the longer the experience goes on, the more cracks you notice in the stonework. Speaking of bosses, of the multitude thrown at me they all tended to have tedious amounts of health, attacks can whittle your life away faster than you can blink or the ability to call in a thousand of their mates. Whacking the boss becomes an exercise in frustration. I never felt triumphant after a victory, just relief that I never had to see that jerk ever again The bosses do play into what I feel is a big part of the game’s problems in that the difficulty ramps up fairly quickly in all the wrong ways. I won’t sit here in my ivory tower acting like I’m some goddess of gaming that can beat *insert popular hard game* with my eyes closed, but I know when a game is being unfair. 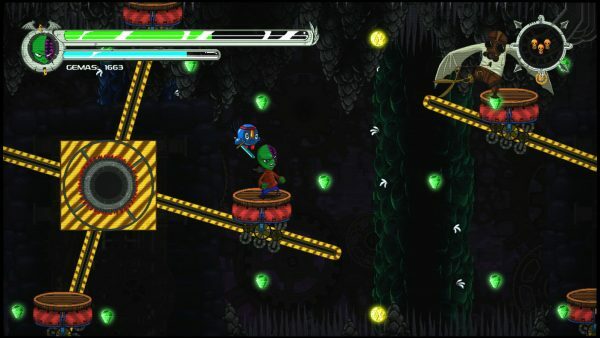 Nightmare Boy’s difficulty relies on the aforementioned throwing everything at the player and poor level design. Enemies can sucker punch you right into deadly obstacles or just shave off half your health through poor collision damage. It leads to many a frustrating death that destroy my will to trudge on. Upon death, the game does a temporary autosave the allows you to keep the progress you’ve made and upgrades you collected whist throwing you back to the last actual save room you saved at. However to permanently save your progress you need to pay a fee, which feels like one of those concepts that gaming had run out long ago for being a bad idea. Like my life, Nightmare Boy lacks any feeling or weight to its main character. Collecting Gems, the game’s currency, lacks any satisfaction. When I pick them up but it feels like it takes the game a minute to realize that I did. Enemies similarly feel unreactive to the character’s punches, you just flail like a fool hoping you are damaging the enemy. Despite nothing being broken,the game just has this odd feeling like I’m not there. Being a Metroidvania game, there are upgrades that help you get around and help you stay alive longer. As mentioned above I was able to grab a trio of jumping enhancements in a short period of time. The rest of my time with the game dropped spells that I felt no need to use or extensions to my life meter. There are probably more types of abilities but based of what I’ve seen so far it’s your standard jazz. I never felt the urge to explore anything but the straightforward path because whenever I deviated from it I was was presented with a rooms clogged with even more death traps than usual that whatever the reward was could not possibly be worth the effort and usually wasn’t. Exploring in Metroidvania style games should be fun and lead to possible profit in game but here it’s a lifeless slog that serves to highlight the game’s flaws even further. The art and story deserve praise as they are the highlight of the game. NIghtmare Boy follows Billy as he’s turned into the titular boy, by a wizard pillow that drags him into the land of nightmares. The story never takes itself seriously and I have no real qualms with it, it sets up a world that is bizarre and interesting to look at with enough mystery to keep me interested. The art complements it by being fittingly nightmarish. The levels themselves feel like a child’s nightmare with their bizarre architecture and weird goings on. There is a creature that I had to look away from at least a few time lest I become the protagonist of an H.P Lovecraft tale. The memorable art design and solid storytelling that will probably endear the game to quite a few despite its flaws. Nightmare Boy’s refusal to step back and realize that sometimes less is more combined with anything you do lacking real weight kills what could have been a decent Metroidvania game. If the same love that had been given to the art and story could be applied to the gameplay then we’d have a quirky little gem. As it stands I’m left wanting a more satisfying experience.